Amps: Personally, I love when a band evolves their sound over the years. Since WATAIN formed in 1998 to present day, it’s clear that you’ve continued to push boundaries of the extreme, as well as the addition of clean vocals on “They Rode On.” What do you feel is the next step in the sonic evolution of WATAIN? Erik: I have a very hard time talking about these kinds of things in such a defined and orderly manner. I believe music and the creation of it must be seen as illogical and chaotic, otherwise it loses its magical qualities. WATAIN has always been about trodding the winding paths of the abyss, and such paths are often steep, twisted and unpredictable. To predict what the next turn will bring is therefore impossible. But the places through which our journey goes are dark and malevolent, and this will always reflect upon the music as well. Amps: How do you feel about critics and Black Metal elitists that attempt to downgrade your art in regards to your blood soaked live rituals and forward thinking sound? Erik: Elitism is a very important idea within the Black Metal movement, but unfortunately the digital whoredom of our age allows for any retard to voice their sheep-minded opinions without having to back it up. The fact that some people cannot relate to what we do is something that comes naturally with the performance of independent and individual art, and I do not necessarily see their opinions as something negative, rather a proof of what we are doing is right and far away from what people “want” and “can understand”. But it is of course another thing when puppies start barking at wolves. Then they need to be corrected. This has happened many times before and will continue to happen as long as we remain one of the apex predators in this cesspool of a scene. Amps: What are your thoughts on the current state of Black Metal? Do you feel the internet/social media has played a role in “demystifying” the atmosphere of the genre or has tarnished what the genre is about? Erik: My perfect vision of Black Metal is much more related to the 1990’s than that of today, in the sense that after the internet-explosion a lot of the important aspects of the genre – secrecy, elitism, intolerance, unity, activism- just vanished. But one cannot dwell on the past, we are living in the present and we must focus on doing as much damage as possible with the weapons that are currently at our disposal. Amps: I have noticed a trend that a new WATAIN record is released approximately every three years. Is that by design and will we see a follow-up to The Wild Hunt sooner rather than later? Erik: That has been the case so far, yes. We like to take our time with such monumental things as albums. But like I said before, it is very hard to predict anything when Chaos is your main source of inspiration for creativity. Patterns are meant to be shattered, rules to be broken. Amps: How does the spiritualism of the band continue to factor into your music? 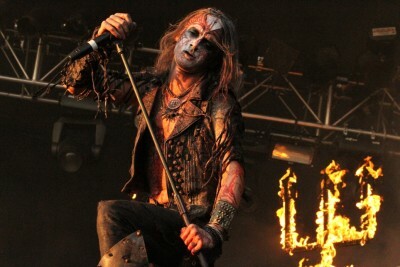 Erik: WATAIN is our Temple in which we have been given a meaning to our lives, it is the place where the fires of our hearts burn. Every chance I get to express something within that context is sacred and life-altering to me. How many people can say that about their day-to-day activities? Amps: You have been touring with live guitarist Set Teitan (DISSECTION and ex-ABORYM) and bassist Alvaro Lillo (EXECRATOR,KAKO DAIMON, and UNDERCROFT), what are the possibilities of adding them to the permanent WATAIN roster? 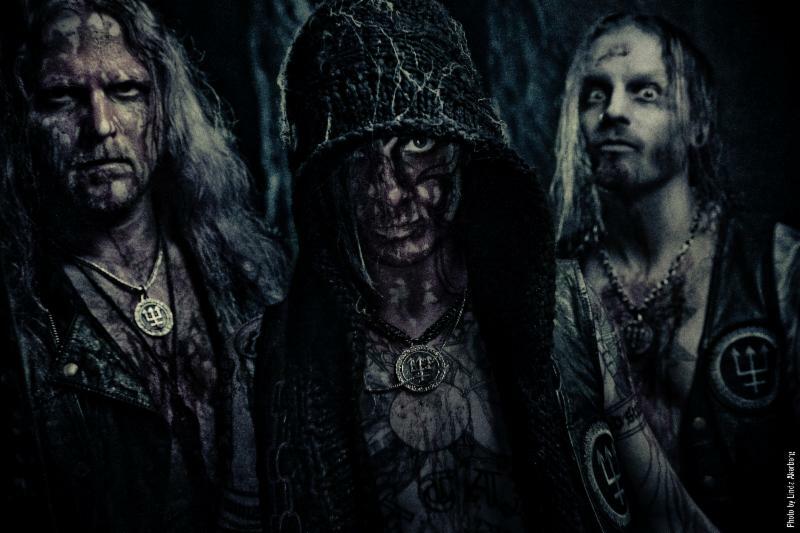 Erik: WATAIN was formed by me, Pelle (Forsberg, guitar) and Håkan (Jonsson, drums) and we have always seen us three as the members of WATAIN, taking in carefully selected people to fight by our side. The line-up we had now with Set and Alvaro is the one that lasted the longest and it is an incredibly strong and spicy combination of people. But generally this is a private matter that people don’t need to know more about. Amps: Your live rituals are certainly unlike anything on this planet. What do you do to prepare for tours? Is there any specific regimen before and/or during? Amps: How did a tour package like this come together? 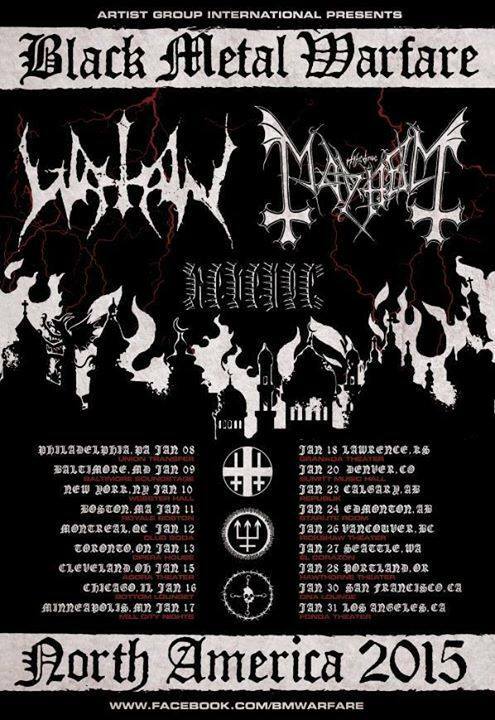 WATAIN, MAYHEM, and REVENGE is a black metal fan’s dream come true! Erik: We had been talking for a long time to both REVENGE and MAYHEM about doing something together and finally a good scenario presented itself. It is a special tour line-up indeed, three very individually strong bands that all add something on their own to a unique combination of extremes. It’s going to be a tour that people will refer to in many years to come, I think. Amps: What albums moved you in some way in 2014? Anything in particular you’re looking forward to this year? Erik: I think the ORDER FROM CHAOS box took the prize of 2014, that and NIFELHEIM’S Satanatas. As for 2015, I really look forward to the new DEGIAL album. Amps: The time is yours. What would you like to say to all the WATAIN Disciples who will be reading this? The Black Metal Warfare Tour is coming for you. And it starts tonight here in Philadelphia. You can gain entry HERE…come in and be a part of the Ritual.